A few weeks ago, my friend Ziggi told me that she had cancer. I couldn't tell anyone, she wasn't making it public on Facebook or blog yet, but now she has. If you know her, do drop in at her new blog and give her a hug. When she spoke to me, she had started to lose her hair, quite suddenly although not, of course, unexpectedly. I don't think anything prepares you for that: it seems, from a distance, as if it's the trivial part but I have come to believe that it's the thing that knocks you back hardest and brings home to you that you are 'differently' ill from any other time - but it does grow back. I'm afraid that ovarian cancer tends to be something that you have to live with, rather than be cured from, for a while. Ziggi is young, has two gorgeous daughters, and has dumped a husband who wasn't fit for purpose, so has everything to get better for. She also introduced me to delicious white tea - which is so delicate that you mustn't make it with boiling water - and made actual scones, with jam and clotted cream, so counts as a best friend. I look forward to seeing her on my next visit South-West - shall I make the scones next time, Zig? It was dark by 5 o'clock this evening, of course. Can't bear it, we're still in autumn. I wouldn't mind so much in December. I hoped that last year would be the last time the clocks went back in the autumn, but rumours were premature. At least an extra hour this morning gave us time for a leisurely breakfast. The Sage brought me a cup of tea in bed. When I was up and dressed, "would you like a poached egg for breakfast?" he asked hopefully - this was a suggestion rather than an offer, I doubt he's ever poached an egg, although he's accomplished in the art of frying and scrambling. I daresay he would not be too daunted by the thought of hard-boiling come to that. We had just finished eating when the phone rang. It was a prearranged interview with an EDP reporter. Yes indeed, my star of radio and newspaper will be in the paper again tomorrow. Someone asked him to autograph a catalogue on Friday. I suppose it was slightly tongue in cheek, but maybe I should start saving all scraps of paper with his writing on, to keep our grandchildren in luxury in a few years' time. I did, however, draw the line this evening (not on paper, you understand) when he asked me which buyer had paddle number 21, at dinner time. He wanted to talk about the sale again. I was starting to relax for the evening, and a discussion about work wasn't on the cards. It's a penalty of working with one's husband and also working from home that we're never outside office hours. Of course, a lot of people deal with business emails at the weekend, it's tempting to get them out of the way rather than clutter up half of Monday morning, and we've always had phone calls at any time of any day, but I think that dinner time on a Sunday needn't be a time for dealing with the smallest details. I said so, reasonably politely, and he was quite surprised, but put his papers down good-naturedly. I did look it up later of course. Some of you will know that there have been ructions in Blogland over the last week, resulting in some friendships strengthening and others being broken. At least two people are no longer blogging, at least for the time being. Yesterday, I decided the time had come to explain to him what has been going on, since he knows some of the people involved (of whom I'm one, in fact). After a few minutes, I looked over at him. He was fast asleep. So I shall not trouble you with the details, just tell you that I'm not affected personally and I'm still blogging. But that last, you had probably worked out already. The Sage was having a drink with a friend, a retired auctioneer from Diss. "Between a retired auctioneer and a non-retired auctioneer," be said. I said, "you could say, between an auctioneer with sense and one without." "Ah, but which is which?" asked Geoffrey. I gave him to understand that he was the one to be complimented. "Still," I added, "I can't see the Sage ever quitting." We decided that the perfect place for him to peg out would be auctioneering - I said, however, that he would have to hold on to the end of a sale, it would be most unprofessional to keel over until the last lot was sold. "That's okay," said Geoffrey. "I'll be his stand-in and finish off the sale." A new customer came over from Brussels specially for the sale. We had already spoken on the phone, so he introduced himself. He collects sparrowbeak jugs; not Lowestoft ones in particular, but from all over Europe. He spent several minutes telling me about his enthusiasm, he's got around 450 sparrowbeaks (these are little cream jugs, so called because of the beaked shape of the pouring lip). He bought several jugs and came to pay at the end. I passed him on to Susie, who is fluent in several languages and they chatted away for several minutes. He speaks excellent English, far better than my French, so I wouldn't have ventured to inflict it on him. The customer who bought the guglet and bowl left with it, without paying. That the Sage knows he is as trustworthy as that will mean more to him than his successful bid, I should think. He'll send a cheque within a few days, once he's transferred the money. Another customer accidentally came without cash or chequebook - I similarly let him have the piece, but it was more like £150 - still, he was also pleased to be trusted. Rog asked, was there applause at the end? Indeed there was. The photo doesn't indicate the size of the jugs - about 3 inches tall. I should have trimmed the photos, sorry. I forgot that these were the originals. But don't look at the background, which is the interior of the light-box, hey. The Sage got the price he hoped for, which was £34,500. Everyone who viewed the sale looked at and admired them, and they have been bought by a collector for their own collection. Since they have been in the same family since 1948 when they were last sold (for £80), it's rather good to know that they will still be handled and looked at closely, not put in a museum to be admired but not loved. So, the sale went well but I'm too tired to think. I'll balance the books tomorrow, right now I'm going to bed. Two of the paintings depict Lowestoft's lighthouses. The one on the cliff was the High light, the one on the beach was the Low light. These are real scenes from the period and at least one of the ships can be named, as can the church. I must be having a bit of an Ian Ke11y moment, when Wink rang to suggest a weekend for us to meet in London and go to the theatre, I suggested the play that he is in. Although, if it had been said to be rubbish, I wouldn't have gone. Someone said they'd seen it in its pre-London run (he wasn't in it then) and recommended it. I haven't yet decided whether I'll stay for a couple of nights, I will see what else I want to do. I don't think Wink will be staying, but then she's had a couple of holidays this year and I haven't had a single night away since last early November. We're pretty well set for the auction, I've still got to mark up some bids and the people whom I'll be phoning during the sale - we can't do online bidding, but we do telephone bids. Someone rings the wannabe bidder a few minutes before the item they've registered an interest in. I claim first place there, you know how I like to take charge! - the Sage is in charge, obviously, no question of a takeover bid from me, but I want to back him up and ... okay, maybe there's a slight ego problem here. Now I'm writing down the people who've already registered. The Sage, encouraged by my sudden keenness, has said I can do a lot of the bidding. Which is fun, but quite stressful, I have to keep careful track of who is bidding for each lot, and there are a few either/or bids too. Looking forward to it? ... well no, not entirely. I do find it both more tiring and more stressful every year. The Sage loves it and has no intention of retiring. I'm glad he's so successful and I do find it interesting, and it's great to see the 'regulars'. But I'll be pleased when it's over and maybe something else can be the topic of conversation for a few weeks. Though that's probably too much to hope for. It was a very good day. I went here to listen to lectures given by him about him and him. Sorry for the linkiness, I don't like a lot of links either, but it really won't help people who innocently google any of those names - simply because I write pretty well every day, it puts me higher up Google searches than I would be otherwise, so I avoid it when I can. Regarding his research for that book, it took him to St Petersburg. He doesn't speak much Russian, so had an interpreter. He also had a Russian guide to take him round the archives. As he was looking at everything, he realised that the guide was in fits of giggles. He asked the interpreter, who was a bit embarrassed. "She is amused at the thought of an Englishman writing about Casanova, the great lover," he explained. And then added, "especially a ginger one..."
I arrived early, to help show people around on arrival. There were 280 people who'd booked and I was fairly busy, guiding them to the lecture theatre and then back again for coffee. I chatted to those I vaguely know - as I'm the Area secretary, quite a lot of people know me but I only know them by sight - a few asked to be reminded of my name, but no one volunteered their own, so if I didn't remember it, I was stuck. Oh well. It had been a brilliantly sunny day, but ten minutes into my journey home, I realised that the sky to my right was deep bluey grey and that heavy rain was brewing. First I saw the double rainbow, then the downpour started. In front of me, the sky was quite light, and the first rainbow was the starting point of the dark cloud. It was very dark in the space between them, slightly lighter the other side. I also noticed, and I'm not sure whether I knew this or not, that the two rainbows were mirror images of each other, not the same. Then it cleared up, a few minutes later it started again. I rounded a bend and there was another double rainbow. The Sage had some good news about a potential bidder for the sale on Friday when I got home. I checked emails and so on, and cooked dinner. Finally, I went into the drawing room. There was a fire burning in the grate. He and Jamie swept the chimney this afternoon and didn't tell me, so that it would be a lovely surprise. You know the thing where one is asked to use three words to describe oneself? Actually, I was told recently about an interview for a headteacher, where that was used as the final question. One of the candidates gave, as one of his or her words ... "lazy." No, didn't get the job. and the original attribution is there on the top right, though it had come along a few steps when I saw it - thanks to the person who devised it. 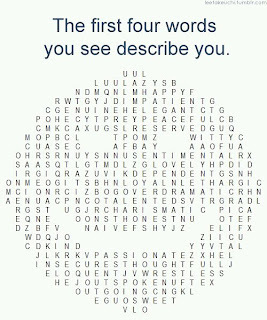 I shouldn't take it too literally - although, if the first words you see don't give a particularly positive image of yourself, you could give it a few minutes of thought. I did, a few years ago, think of three words I might use to describe myself, but I admit that I can't remember them all now. I'm pretty sure that none of them was forgetful, but maybe it should have been. I will tell you the one I do remember, which is 'enthusiastic.' Bless her, hopeful Z of those years. I know, darlings, is there anything more dull? I wouldn't use it to describe myself, but I'm called it too often to deny it. It's not used as an insult or criticism, I do appear to be a person that people are inclined to be kind to ... although I don't mind in the least being criticised. How can one learn if one doesn't listen to what people say? I don't suppose I'll ever learn much, on the other hand - no, I'm starting to ramble. I don't think it is on the list above, by the way, that is put there simply for you to amuse yourselves for a few idle minutes. And this morning, I have mostly been making potato soup. Sensible, you see? Zerlina woke before 6 this morning. I took her to the bathroom, then back to bed where she slept for a couple more hours. Weeza wonders how I do it - z hasn't had a daytime nap for weeks and normally wakes about 7. I am extremely relaxed and fond of rest and this evidently is absorbed by my grandchild. We spent much of the day with Dilly and the children, walking into town in the morning and going to the local air museum in the afternoon. Here. Just for an hour or so, and partly to find some clues - Al and Dilly and the children enjoyed geocaching when they were on holiday and have been doing it locally too. It is half term week and fortunately the weather is still fine, although windy today. Weeza said her husband had an arduous cycle ride to work today against the wind and felt exhausted by the time he arrived. It took him over an hour and a half to cycle twenty-two miles, apparently. Appallingly slow, I'm sure you'll agree, hem hem. This morning, I started up the computer and the desktop photo happened to be one of Hadrian, taken just before he went on holiday. He was sitting on our sofa, smiling and I was startled to realise how like my father he looked. The thing is, Al looks like my father in his young, very thin days, but in middle age he put on some weight and his face looked fuller. And Hay, although chubbier of face than that, had just the same smile and look in his eyes that I remember. It always surprises me, how quickly I snap back into getting jobs done while looking after a small child. I'm adept at managing to carry a baby while cooking, cleaning and so on, and it is possible to do almost anything one-handed if one tries. When there is a slightly older child, the knack of scurrying about in the few short moments while he or she is busy and not requiring one's full attention soon comes back. However, there was nearly a full hour this afternoon when Zerlina fell asleep on my lap and I could do little except read the bits of the newspaper that were visible without turning broadsheet pages. Little z has officially given up her daytime nap in the past few weeks (her own choice, not her mother's) but I evidently have a deeply restful aura about me. Later, I managed to cook a roast chicken and a steamed jam sponge pudding and serve it two hours earlier than we normally eat, as well as taking z for a walk, feeding the chickens and giving apples to Big Pinkie. Pinkie was a naughty girl, by the way - I mentioned a while ago that she'd gone walkabout, and the Sage and Jamie tried several times to tempt her back across the fields. She would follow them for some way, but then simply stop and refuse to come any further. In the end, the farmer had to bring her back in the trailer. She wasn't too thrilled about it, and was quite huffy with Jamie, but seems back to her good-natured self now. Back to the matter of carrying babies - I think the trick is to keep a straight back. Bending over while carrying a heavy child is a recipe for an injured back. As long as my knees hold out, I should be fine. You know the articles that there have been in the past few weeks about people being 'over-housed'? There are, apparently, 25 million spare bedrooms in the country. I have to say that some of them are in this house. And I'm sorry if you think we're 'hoarding' our housing, and I'm also sorry if you are short of space where you live; but I don't think that the two situations are directly linked. And we're not moving anyway. But it's true that we've got rather more space than we regularly use, and that's a pity. There are four living rooms, and we use two or three. You might think that even that is a lot for two people, but we're the spreading sort. So the drawing room and the study are used all the time and the dining room is used all summer and only heated in the winter if there are enough people here to make it worth the bother. And the Sage puts stuff in the other room, which is not a brilliant idea because it ends up with boxes and trayfuls all over the place and it is unusable much of the time. Now, we are planning to redecorate the drawing room, and while we're about it, we can do some other work there. When we moved here 25 years ago, we bought a Multiyork sofa and two chairs, and 14 years ago we bought new loose covers for them. However, the third time I had the cushion covers dry cleaned, the colour ran and they were ruined. So I put the old covers back on, and did some repairs as they wore out. I've been looking into getting new loose covers, but the cost is huge for 25-year-old soft furnishings and it would make more sense to buy new ones. But it does go against the grain, the chairs themselves are in very good condition and haven't even started to sag or wear. Anyway, I've gone through all the covers I've got and I've found that I can put together the sofa and a big square footstool in one material and a chair and a footstool in another, which would only leave one redundant chair, and we've got loads of armchairs, a shortage of furniture is never our problem. However, the two materials do not go together and can't be put in the same room. That was all the preamble to my good idea, sorry it's taken so long. The unused room, which is so unused that it doesn't even have a name, will be turned out and have a new life as the dining room, the present dining room, which leads into it, will be another sitting room - I love that room, it's wasted as a dining room because it's got a beautiful inglenook and you hardly notice it. Then we can move into those two rooms (instead of the study, which is full of my stuff) while the drawing room is done up, and then we can sit in comfort, each in our own space, and never have to meet again in the evening except at meals. Which is, you have to agree, leads to happiness between two long-married people who work together and need to have something to talk about at dinner time and for bedtime to be a joyful reunion. What is good about this too, is that it will give us somewhere to put my pianola when it eventually returns. End of July, my left foot. But the best part is, the Sage and I have another project (this is going to take weeks, nothing is ever simple in this house). What I love is that we adore each other's madcap projects and enter into the spirit of things at once. It's all completely unnecessary, of course, but it'll be fun. I didn't know my mother's grandmother of course, she died about twenty years before I was born. There is a picture of her as a fairly young woman, one of those Victorian photographs that was tinted to look like a portrait. My mother used to say that I looked like her. My mother's mother died when she was only twenty-five and her father's engineering job took him away from home, so it was up to the grandparents to look after the 18 month old child. Two of the four parents had died already, but his mother and her father, who were cousins and must have known each other well, had set up home together (they were not, of course, 'living together' in the modern sense). My mother adored both of them and was very happy with them. Grandmother (I don't know whether she was called Granny or Grandma, she was always referred to as "my Grandmother" and I'll call her Grandmother here) was a rather formal Victorian lady and very firm about the right way to behave. It was the 'right' way, too - not just formality for the sake of it, but to behave in the best, kindest and most honest manner at all times. For example, a shop assistant or a maid must be treated politely and considerately - "Never be rude, my dear, to those who cannot answer back." She dressed mainly in black of course, but suitable colours could be worn in a blouse. My mother remembered going shopping for material to make a new blouse. The young assistant asked what colour she was looking for. Grandmother stood erect and firm. "Heliotrope," she said. Mummy remembered all her days the confused look on the girl's face. Grandmother had three sons, two six-footers and my grandad, who was five foot seven. Both the others died in the First World War. When the wartime archives were put on the internet, my sister looked for and found them both. Their mother was with each of them when they died, in fact, for one she travelled to France to the field hospital; the other was brought back to England and she went to be with him. My grandfather was in the trenches throughout the war but was never injured, or not seriously at any rate. Grandmother suffered from dreadful headaches (Mummy realised, later, that they must have been migraines) and sometimes had to retire to bed for two or three days. Once, the little girl had a bad head herself and said so - it was, poor child, the first migraine of those that laid her low regularly all her life. She remembered the look that passed between her grandparents, obviously thinking she was copying Grandmother, who asked her exactly where it hurt. When she said, at the side and behind her eyes, she saw them realise she was telling the truth. My grandfather remarried when his daughter was seven years old. In the way things were done in those days, the fact was presented to her after the marriage had taken place and she had the shock of being taken away from her home and beloved grandparents. It's not surprising that she clung on to and treasured memories of those years with them. They were certainly the happiest of her childhood. The drive is finally done and looks great, although the chippings are still quite loose and need a good rain and being driven on a few times to bed them in. Apparently, two tonnes of bitumen alone has gone on to the drive, as well as a lorryload of stone chippings! I'll have to sort out a few photos and show you, it'll take a while though and I can't quite be bothered as yet. Which is not the right attitude, but it's not that interesting except to me, let's face it, so I don't suppose you mind. I drove over to Beccles to pick up my friends to take them to Norwich for lunch, but one of them wasn't feeling well so it was just her sister. On the way home, a car was waiting in a side road to my left (that is, on my side of the road, we being quite peculiar in this country and driving on the wrong side of the road), angled to go across the road and turn right. As I approached, it moved forward a little so I slowed and prepared to move slightly to the middle of the road to give it a wide berth. And then, far too late for me to stop, it pulled out right in front of me. I cannot think what the idiot driver had on her mind, I don't think she saw me at any time. Her complacent face didn't look towards me at all as I braked and swerved. If I hadn't already slowed, I'd have gone right into her at 50mph. And if the side road had not had a widely splayed entrance, I'd have hit her rear. As it was, I had room to miss her. Lilian and I looked at each other. "Good as a mile, hey," I said. I'm finally, several hours on, starting to feel a bit shaken. Still, onwards and upwards. It didn't happen. I went here today. Very interesting and it's been a good day. When they built/rebuilt the house in the 1930s, they spent an astonishing amount of money on it - all the more remarkable because they didn't actually own it, it was only leasehold. They incorporated all sorts of features that I hadn't realised had been invented by then, such as an elaborate under-floor (and upstairs, sometimes over-ceiling) heating system, all powered by a boiler in the cellar. Only trouble was, it didn't occur to the architects or anyone else that you don't need exactly as much heating in all parts of the house at the same time, so when it was on the bedrooms tended to be far too hot as it was all on a single circuit and there was no way of controlling any individual area. They also had the facility to pipe music into any room from the gramophone and had a system for the vacuum cleaner, so that a hose could be plugged into an outlet in the skirting board and the motor in the basement sucked all the dust up into a central container. Rather appealing work-saving idea for people who had plenty of household staff and never picked up a duster in their lives. We had a really quick journey and arrived over an hour earlier than we expected, so had coffee and had a look around the gardens before the tour. We also had no hold-ups on the way home, very lucky. I'd had to leave home early this morning because, on my way home last night, the low fuel light came on. I have never established quite how long I can go from that point, but occasionally have gone right down to pretty well flat-lined (usually on the way home from Mike, he seems to have the knack of returning my car to me at just that point), but I haven't run out of petrol since I was 18 years old and my mother, my sister and I all used the same car ... I don't know who drove it home almost empty one Friday, but the car stopped less than two miles from home when I drove it the next day. Taught me a lesson anyway, hasn't happened again in all these years. It was surprising to me, how many other people were filling up at 7 o'clock this morning in Norwich. I have to admit that, whilst I used to check oil, water and tyre pressure in my car, I've rather let the job go over the years, because the Sage does it anyway, whether I do or not. I was in bed by nine last night and, apart from being woken by a phone call at nine thirty, I slept right through until the alarm this morning. So I have functioned perfectly well today. Music at the school this morning. The teacher was a couple of minutes late, so I let the pupils in, they all put their bags in the corner, sat down without being told, then I stood in front of them, introduced myself (I haven't been in this class before) and said that the teacher would be there soon. There was total silence. I felt that they were waiting for more. I was about to say, er, you can talk to each other for a few minutes until she arrived - when she did. Which was just as well, that degree of good behaviour might have gone to my head. I went to Gardening Club this evening, which was good, because I never made it at all last year. I make my good resolutions in the autumn more than in January, and one of them is always to be more sociable and not to let duty override pleasure - good intentions always peter out after a while though, there gets to be too much to do and something has to give. The other good thing is that my car has passed its MOT again. I'm still not fond of it, but it's been very good value. Only cost £1500 three years ago, then on 98,500ish miles, I've added another 18,000 and the engine sounds as good as ever. I have no excuse for ditching it - and I won't do so. Mike dealt with it all, and so I had to get about on my bike today, which felt very worthy. After all this time, I'm sure that cycling shouldn't still feel like an effort, but it does more often than not. Getting on with the drive, they aren't going to be here tomorrow, but will do the resurfacing on Thursday and Friday, having almost finished the preparation (the Sage has decided we need another soakaway, so that's being dug). It'll be quite chaotic around here, I daresay. I must remember to move the car to the road, I need to go out on both days - though possibly by bike on Friday. It'll be great to have it done. The job was started in April - although we have done a lot else over the summer, it's not been a single job that has taken all that time. The hedgehog in the title was in the road on my return home tonight. Confused by my lights, it started to run one way and then the other; it was a narrow country road and I didn't know how to avoid it. So I stopped, rather abruptly. And then had to reverse because I didn't know if it had curled up or run away. I have been awake rather a long time. I had no sleep at all last night. Literally none, not even a brief nap. I lay for a while, turned on my phone for a while, when the light made my eyes tired I turned it off and tried to settle - nothing worked. At about 3 am, playing PathPix Pro, I noticed something crawling across the sheet. I couldn't tell what it was and had to turn the light on, just a flicker on and off, to see that it was a ladybird. The light didn't wake the Sage, but opening the window to bundle it out did. After that brief excitement, he went back to sleep. I didn't. I finally got up at 4, meaning to do some typing of the minutes from last Friday, but then it occurred to me that, with the Aga off for its service this morning, it was the ideal time for a really good clean, so that's what I did next. Later, eating an apple and drinking camomile tea, I made a good start on the minutes. I really thought that I'd have a nap at some time, but it didn't happen. It did not help that the governors' training session in Lowestoft that I thought was going to take a morning was actually a full day. I have been awake for 36 hours and I'm still not especially tired. I am, however, quite cheesed off. News of the day is that work has started on the drive. By the end of the week, weather permitting, it should be done. And now it is time for University Challenge. I know nothing, but I watch it - it's almost the only programme I watch - for old time's sake, because Bamber Gascoigne was my first heartthrob. Paxo isn't in the same league, of course. I tolerate him, however. There is something about reaching the top of the family tree, I think, that concentrates the mind. Both the Sage and I have elder sisters, but no living parents, aunts or uncles. And I've been thinking about my grandmothers. I know so little about them, you see. My mother's mother died when she was only 25, from complications in her second pregnancy, so there's very little to know anyway. She had a lot of siblings, she was the ninth out of ten children, but my mother lost touch with them during WW2 and I know nothing more, except that her name was Janet. But my father's mother was still about when I was born, though I doubt I had much contact with her. I've mentioned her before, I know - she was the daughter of a very wealthy owner of a Norwich brewery, she married at the age of 16, had a son at 17, bolted at 21 and was married after the divorce to the father of her second son, had a third, then her husband died of cancer and my grandfather, seeing her destitute (her parents had cut her off when she'd 'misbehaved'), remarried her from a sense of honour. The youngest son died in the war - not in action, actually, in a flying accident. She had cancer in her face and had early radiation treatment, which killed the bone so that the wound never healed over and she wore a bandage tied carelessly round her face from then on. She was an alcoholic, had a sharp wit, was not loved by her eldest son who had had a miserable childhood, abandoned by her when his father was away during the way, my sister was afraid of her and she died, a vastly old woman from her appearance, at the age of 63. Once, out with the family, when my sister was a child, they parked the car at the same time as another small saloon drew up. She watched in silence as a family piled out. Mother, father, grandparents, a procession of small children - no seatbelts in those days and children must have been on laps, crouched on the floor, they had squeezed in anywhere there was a spare inch. When the last finally emerged, Grandmother spoke. "I suppose ... the others couldn't come." We still say it in our family. When my mother first met her in-laws, on her wedding day (and after she and my father impulsively married), the door was opened by the butler and they were ushered into the drawing room where my grandfather, just out of hospital after an operation, was in his dressing gown. They were given sherry. My mother took a cautious sip, never having tasted it before, and put her glass down. She caught a movement out of the corner of her eye. "My word, dear girl," boomed her new father-in-law. "You're fond of sherry, better refill your glass." Strictly rationed alcohol didn't suit a desperate drinker, and she grabbed it when she could. My grandfather was devoted to his civic duties. He was a town councillor and alderman for many years and was mayor of the town for a total of 13 years, including all through the war. Their remarriage was not happy, and my mother always wondered, was Grandad always out because Granny drank, or did Granny drink because Granddad was always out? I have absolutely no way of ever knowing, but I can't help wondering what her point of view was? Was she reconciled with her parents, before or after remarriage? Apart from her youngest son, my uncle John, did she love anyone? Did she have friends? I have a few photos of her, but they are indistinct - the most noticeable thing is the bandage or scarf knotted around her head to cover her cheek. I have her napkin ring. Her name was Helen. And that's about it. The whole family was here in the end, all thirteen of us, which was brilliant. Must be ... oh, I don't know - well, several weeks. A month or so, I should think, which is a long time for a small baby. Augustus now weighs over 12 pounds and is 2 feet long. He's 8 weeks old today. I carried him around much of the afternoon, asleep against my shoulder. The weather was wonderful for the fete, warm and sunny and, although it was rather slow to get going, it became busy during the afternoon. I'd spent a couple of hours in the morning making cakes; two chocolate cakes and two dozen fairy cakes, and I bought other cakes and a pavlova, so didn't have to make a pudding tonight. Hay, who is not officially on solid food yet but who enjoys trying flavours, spent some time sucking on a slice of cooked courgette, and some more munching a piece of kiwi fruit. It still doesn't seem right to call it kiwi fruit, you know. I'm such a stick-in-the-mud. To me, it'll always really be a Chinese gooseberry. And physalis is Cape gooseberry. And Sharon fruit is persimmon. Come to that, it took me years to adjust fully to decimal coinage. I translated back for ages. This came in handy two and a half years after the switch when I married the Sage; where we went on honeymoon, the rate of exchange was 13 rupees to the pound, so I just thought in one-and-sixpences. It's slightly less convenient now, when I find that I am unable to think in metric weights and measures and always have to convert. It's not difficult - indeed, if it were harder to do, perhaps I'd need grams to become second nature to me. As it is, I'm fairly sure I'll think in pounds and yards all my life. The Summer Fête is tomorrow, held over from July, when it was rained off. It's very jolly to find that Weeza and co are coming over, also Ro and Dora. Weeza hadn't thought they would come, because it will take place about the time of Zerlina's nap but unfortunately, in the last couple of weeks, she has pretty well abandoned her daytime nap, which means she's a bit tetchy by the evening - but at least they aren't so limited during the day. I've said I'll make cakes, but I haven't had time, so I'll have to do it in the morning. I think I'll also be helping on a stall, but with any luck there will be plenty of us and I'll just have to do an hour or so stint. I don't think I'd be a bad influence on anyone if I nipped over the road to the pub and brought a pint back with me, do you? Ro asked casually if I was thinking of providing dinner in the evening, so of course I said I would. Not sure yet what to cook though. Something that everyone likes and doesn't take long to cook. Followed by cake. We're hoping for dry weather next week, because at last the drive is going to be resurfaced. I don't recommend that motorbike riders come along it for a week or two, there might be some wayward chippings, but after that it should be fine. In addition, the substantial pile of very large logs (the fallen oak from the hedge by the drive) that cluttered up the front garden are being split and moved, to be used for firewood. The pile of sand near the logs has been used in the bricklaying and the area cleared. And the last of the potatoes have finally been dug up. It seems that things are finally coming together a bit chez the Sage and Z.
I had a few minutes to spare when I arrived for music after lunch today, so I went into the library to see what was going on. A couple of tables were occupied by people playing chess and draughts. A girl who knows me bobbed along to greet me and she started to tell me that she'd noticed a Year 9 (still the year of entry) girl spent a lot of time on her own, eating her lunch alone and then sitting reading, so she'd made her come along to play draughts and she had proved rather good at it, so was making friends and joining in with things a lot more. Her friend (a third girl) then started chatting to me about her family, books and her interests at school; after a few minutes she politely excused herself, thanked me for my company and explained she was due at Biology. All charmingly polite and awfully keen. It is a very friendly school. So unlike my schooldays, I can't imagine going and engaging anyone in conversation like that. Music went well, I spent my time helping pupils who had never played the guitar or keyboard before. Not that I play guitar myself, but I can show the basics. They were playing Word Up, which I don't think any of them had heard before. Quite a pleasure, after last year's Coldplay effort. I have to think I'd have grown up a very different person if schools 40-odd years ago had been more like they are now. It would have taken such determination to remain silent and withdrawn, only producing good written work and rarely speaking in class, and not bothering with subjects I didn't care about, that I wonder if I'd have succeeded in holding on to my reserve. Nowadays, I'd be given targets and things, including joining clubs. I was a dedicated non joiner in those days and I'm still more an observer than a participant. That I never took up smoking, for example, was for two reasons. One, that almost everyone smoked, and I didn't do things because everyone else was, peer group pressure had the opposite effect on me. And two, that I had not the least intention of being addicted to anything. That I didn't try drugs either was for those reasons too (not that *everyone* was doing it, they weren't, but there were plenty around in the early 1970s), plus that I wasn't going to do anything that might make me let my guard down without meaning to. Evidently, I've always had that control-freakish tendency. Although, only of myself. Everyone else can do what they like. Liberty Hall around here, darlings. It's a question that I've asked local authority education experts on more than one occasion at training sessions over a period of year, and they've looked startled and evaded the issue, but what I'd like to know is this. If a pupil has been permanently excluded from a school because he or she physically attacked another pupil or a teacher, and the governors of another school agrees to accept him or her and it happens again, are they liable because they knew there was a risk? Since they could not answer, my answer was, obviously the governors would have to refuse to accept the pupil. If there was an appeal or (since, until now, the LA was the admissions authority; now the academy is) the LA said the school had to take the pupil, the school itself could not be held liable. Who would, is another matter. No, we have not at this time been asked to accept a pupil who has been violent or aggressive. Just wondering. Anyway, darlings, you'll be terribly impressed, or possibly laugh like drains, to learn that I've been re-elected chairman of governors. It was a shoo-in, to tell the truth. No one else has as much time lying heavy on their hands, or is quite as foolish as I am. I did, in fact, tell the Head a couple of weeks ago how long I was prepared to stay, so he knows where he stands. I had a very substantial lunch, beef stew with a cobbler topping, carrots and cauliflower. I turned down the mashed potatoes. It cost £1.80 and was very good. The plate was piled high and I had difficulty clearing it, but I didn't want to hurt the cook's feelings, so I ploughed through. I then spent the afternoon meeting sipping away at several glassfuls of water - just the one glass, darlings, I refilled it - so that I would be all set for losing a pint of fluid later. Having once fainted afterwards, I take every precaution. And now, I'm relaxing with a nice red wine. I must look up what it is. Tomorrow, Year 9 music. Now, I shall phone Wink. She arrived home from her holiday in Spain today, and I need her passport number to book a holiday for both of us next year. The day has gone quite well and I felt rather good about things. I spent the morning getting ready for tomorrow afternoon's governors' meeting - I know, a whole day in advance! - and did other work in the afternoon, feeling quite cheerful and ready to reward myself with a glass of wine before 6 o'clock. It was just as well that the Sage arrived home just then, as he had pushed the cork back into the bottle last night with such energy that I couldn't get it out. Even he found it quite a struggle. I secured it myself tonight so that I can manage tomorrow. I'll be late drinking tomorrow, mind you, I've got three meetings, one after another, from noon until nearly 6, and then I'm going to the blood donors. The 23 report forms that I combined into a single PDF yesterday has thrown up a peculiarity. One chairman wrote rather huffily to say that I'd altered what he had written. He didn't suggest I'd done it on purpose, but evidently thought I'd been careless. I explained that I'd not done anything to it, just added it to all the others, and on my copy it was exactly as he had sent it to me. Bemusingly, it had altered in the sending or receiving. I've now send out his individual form to everyone, asking if they will compare it with the combined version, and so far I've had one reply saying that it is not the same. Fortunately, it won't be up to me to solve the problem. If I'm really lucky, they will decide to abandon Nuance in favour of something that works on a Mac. That reminds me, I've got to alter an address book and send another email, welcoming a new chairman. All this damn politeness. So not me. As you know, darlings, I am a grumpy and surly old bat by nature, and my cheery outward persona is all for show. Toodle-pip. Have a lovely evening. The picture at the top of the page is an 18th Century Lowestoft cuspidor, otherwise known as a spittoon. It is there to show Tim and will go in a day or so. Slightly lowers the tone, don't you think? I spent all afternoon on the Sage's laptop. In a using sense, not a squatting one. It was fine, if dispiriting. I had about 25 documents to download, several to type, then I had to combine the eventual 23 into a PDF with a rewriter - which is the reason I couldn't use my computer, the programme isn't compatible with Macs. Every time I downloaded a file, I had to resave it to the desktop, because I couldn't find it. Where on earth do they go? I looked all over. In recent documents, in downloads, I conducted searches - I daresay it's absolutely straightforward once you know, but I don't know and I couldn't find out. Still, the job has been done and sent out and I'm ready for my meeting on Friday. I'm not yet ready for Wednesday, but there's still a day in hand. I downloaded an app that means you can handwrite directly on to the iPad, using your finger or a stylus. Using my finger works, but can anyone tell me what to use as a stylus? My finger handwriting is dreadful! It's very convenient in other respects, but I really do need a tool to write with. A leadless pencil doesn't work, nor does a chopstick. Mind you, one of the things I bought it for was to be able to write musical notation, and that's fine. Nothing complicated, it's simply that a clarinet is pitched in B flat, so to play with instruments pitched in C you have to go up a tone. And, every time I write it out, I use it and then lose the paper between then and needing it again, several months later. So having it on the iPad will be a Boon and a Blessing. Big Pinkie decided to leave the meadow again this morning. We had a phone call from Jonny, saying that another farmer had seen her. So we went and searched, but we couldn't find her, so concluded that she'd moved on to another field with lots of cows instead of her friend 109. However, the farmer has since moved the rest of the cows and left her. "Could you lead her back?" asked Jonny this evening. Well, only trouble there is that she will follow but not be led. So one would have to walk half a mile with nothing but a bag of tempting apples to stop her turning into someone's garden or getting spooked by a dog or something. The Sage has not been able to find out where she got out, but I suspect her of having opposable thumbed hooves. I have not forgotten the time, several years ago, when she let herself out of her field, into my kitchen garden, ate all my sweet corn and went back to the field again. We never did know how she did it. I think I mentioned a while ago that Jonny has started to sell unpasteurised milk from the farm gate, and very good stuff it is too. His mother makes clotted cream, and sells 10 tubs of it a day. Clotted cream is not hard to do, but needs care, as it's quite a waste if you go off and forget it. Hers is delicious, I'm restricting myself to tiny quantities but still feel that I will gain a whole lot of weight if I indulge more than occasionally. Scroll down, if you would be so kind. Because that is absolutely my experience, and I know it from the other side. It has been my misfortune, some years ago, to have to work with a couple of people who were B players at best. I liked them personally, but was incapable of working with them, in the end. Not working for them, I'm speaking as a volunteer, although in one situation I was, ludicrously, seen as a threat. The person in charge cannot personally oversee everything and has to delegate. However, the more you delegate, the more you lose control. Therefore, the people you delegate to are vital. If you have inferior people below you, that may be all right as long as you are not so busy that you can't monitor what is going on, but in the long run you cannot do it all and still keep looking ahead. It's easy for me, so let's get me out of the way, because it's not about me. I've been a chairman a few times and what seems to me to be the most important thing is to do the job to the best of my ability (passing on as many tasks as I possibly can, because I'm bone idle and expert at nothing), to keep an eye open for someone to take over, to help them get going (either before or after I'd stood down) and, then, to let go and move on and not be missed. If it fell apart without me, that would be my bad management. Ideally, not only would I not be missed, but people would say "we thought Z was pretty good, but actually now it's better, so she can't have been all that." And, even if I was secretly a bit downcast at that, it would be a good thing - and true anyway. But I'm a volunteer anyway, and a determined amateur. I am referring to people who are paid to do their jobs. And, now I think of it, I'm actually thinking about three people, one of whom was very good, but ideally an excellent second in command, and two who were not quite up to it and afraid of being bettered by those beneath them. The first coped by being extremely hands-on. Capable, liked and respected, he nevertheless didn't take steps to build a really strong team and he didn't have a clear and ambitious vision. He could keep things going, and build on what was there, but there were never going to be great improvements or innovations because he wasn't able to step back far enough to see the horizon and what it could hold. However, he knew both his strengths and his limitations and was absolutely big enough to acknowledge them, and the time came when he stepped aside, having done a good job. The other two were different cases entirely. In each situation, they portrayed themselves as strong leaders ... but actually, the only way they knew how to lead was to have no competition. The trouble is, the previous leaders had been A players who had built up a strong team, so the incomer needed to destroy that to seem the strongest person. In one case, that meant that he became a bully - and, if he hadn't been removed, all his staff would have left within a couple of years, instead of just a few of them - and in the other, he refused to delegate, insisting that everything be taken to him, that he attend and chair every single meeting, however minor, and that he would do all but those jobs he considered menial. In fact, he didn't have either the time or the capability and it wasn't long before things started to decline quite badly. If a few people, still enthusiastic, got together to come up with a new idea (and took it to him as a suggestion), he said that they were creating a 'splinter group' behind his back. Neither of these people were personally disliked, certainly not by me, it's just that they had neither the strength nor the confidence to let someone else shine. And when there was a success, they claimed the credit, even if it was little or nothing to do with them. This morning we went to the local theatre, where a friend and recently retired local journalist was holding a doo to launch his latest book. I bought a couple of extra copies for friends and chatted to various people for an hour or so. Well, I nipped out for twenty minutes to do the weekend food shopping at the butcher and greengrocer and then came back to find the Sage still chatting. Glancing at the theatre programme, I found that this evening's performance involved the songs of Tom Lehrer and the monologues of Bob Newhart. Always ready for a chuckle, I bought a ticket, and I've just got home, having been well entertained. The most important news of the day, however, is that Al, Dilly and the children are home and really enjoyed their holiday. They came through for a cup of tea and we gave them their post, which we'd been holding for them. There was a parcel from Amazon which Dilly opened; it contained a cup for Hadrian - I'll see if I can find it in a minute, it was quite amusing - and puzzle books for the older two. Pugsley's was mazes and Squiffany was crossword puzzles, quite simple ones for a child. She asked me to show her what to do, and half an hour later she had more than half-filled the book and was asking if the next book could be a lot bigger! This is the cup. Hay took it and immediately put it to his lips, so we'll see what will happen when it actually has liquid in it. Tomorrow, as I said before, it's Harvest Festival. I've got an easy ride, not having been put down to do anything at the mid-morning service. I am sidesman and lesson-reader at the early service, however, so I've set the alarm on my phone as well as the bedside radio, to be quite sure of waking up. The Sage and I went to a wine tasting this evening. It was a lovely evening in fact, at the Yacht Club in Lowestoft. I've been a member *forever*, the Sage since he moved to Lowestoft in 1968 (in fact, my membership in the book dates from the date I turned 18, but I was a junior member from small childhood). They can't have made a lot of money from it, they were pouring reasonably expensive wines (from £11.50 to £19.00 a bottle) in generous half-glassfuls (unless you stopped them), and there were eight of them, and plates of substantial and beautifully cooked tapas came along, a different plateful, each with two different items on, per wine, and we paid £18 each. I did drive home. And yes, I was perfectly fit to. I limited myself to three sips (not gulps) of each wine and I doubt I drank a standard glassful in the whole evening. I, the Sage and our friend were, I suspect, the most sober persons in the room. We were certainly the most sober people at our table. I learned my lesson a very long time ago, when I went to a wine tasting with cheese. I can drink, or eat high fat food, I can't do both with impunity. I also learned that, when you're drinking a part-glass of several different wines, you can't keep track of the total. So, even if I hadn't been driving, I'd not have had much more than I did. Earlier in the day, I did a large flower arrangement to help decorate the church for Harvest Festival, then helped serve teas after a funeral (my friend Brenda did most of the work, I just lent a hand) and then took boxes of fruit and vegetables and arranged them around the church. Some churches, I know, discourage gifts of fresh produce and prefer tins and packets of food to be given. I find that dispiriting. I take potatoes, carrots, apples, pears, tomatoes and so on. Proper harvested food. The village schoolchildren will take them round to elderly people in the village after the weekend, each with a bunch of flowers. I've always been willing to take advice. Indeed, I ask for it. When choosing a new appliance, it's very useful to go to someone who has done the research already, chosen a product and can recommend it - or not - and tell you why. Several times, I've asked for advice on this blog, for my present dishwasher for example. My vacuum cleaner, which I've had for well over 20 years, was chosen simply because my sister happened to mention that her daughter-in-law had one she was pleased with. I asked, it had some features I particularly wanted, so I went into Bonds (now John Lewis) in Norwich and bought it. Didn't look at another. In about 1989 or 1990, I decided I needed a computer. Not because I was interested in computers, just as a working tool. I had no idea how to go about choosing one, and I asked my friend Alan, who was a busy man with his own business, was impatient, fun to be with and generous. He said that he'd bought an Apple Mackintosh a few months previously. He had, a year before, bought a PC, but he couldn't get to grips with it at all, so had cut his losses, started again, and never looked back. It was, he said, easy for a busy person with no expertise or interest in computing to use. It just worked. I went to Jarrolds, and all I had to do was decide how much to spend. I love not having too much choice when I haven't the experience to base my choice on. I bought my first Mac and a printer (the one suggested by the assistant), brought them home, plugged them in and worked out, with remarkably little difficulty, how to get them going. Now, we take for granted that a computer should be good-looking and easy to use. It wasn't always the case. Similarly, mobile phones were often full of gadgets one didn't need, whilst the ones one did use needed a manual to learn. In fact, I still have trouble finding my way round the Sage's htc and really regret not having sprung the extra for an iPhone for him. Even the techno-clueless Sage can use my iPhone effortlessly. There's never the problem that I don't know how to do something, I can simply work it out. There is, however, sometimes the sudden joy of discovering some new little trick, which is fun. Simply, I don't care in the least if you have vowed never to buy into Apple, not even if it's "just because" and not for clear reasons. I'm not going to say Macs are better than PCs, I daresay they aren't, although anyone who hasn't used both extensively doesn't really have the experience to say. But the reason that all computers look attractive, are compact and are pretty intuitive to get to grips with is that Steve Jobs led and the rest had to follow suit. Without him, they wouldn't have had an incentive. I realised yesterday that I have a slight problem about letting go. I have a reputation for being the one to come to for information, because I hang on to it, both in fact and in my memory. For example, when the village school was advertising for a new headteacher earlier in the year and Al was given the task of writing part of the information pack, I looked out the previous pack from eight years before which I still had, although I hadn't been a governor there for nearly five years. Last year, I was asked for some details of the constitution of the governing body and I was able to provide the reason for the changes that had been made a decade or so previously - someone on the Parish Council had asked why it no longer had a governor representative, and it seems that I was the only one who knew. Nothing particularly unusual here of course, and many people have careful files going back decades. Mine are mainly in stacks of box files, in my memory or on the computer and not very organised at all. Yesterday, however, I decided that there are far too many duplicate photographs on the computer, so I spent a while eliminating those, but then I realised that all the photos themselves are in iPhotos so, apart from the ones I use for my desktop background, which changes every 15 minutes, and the files I have from past sales (because the photos of china haven't been labelled with the lot numbers in iPhotos), there was no need to keep them at all. I started putting files in the trash folder. And then the time came to go to "empty trash." And I couldn't. What if iPhotos was down when I wanted to look at a holiday snap that wasn't in my desktop photos file? I'm not sure what I mean by iPhotos being down, but I found I couldn't risk it. I recognise this is absurd. I will do it again and complete the task next time. But I was startled by the feeling of panic that I felt at the thought of throwing away those files. Today, mostly meetings. Fortunately, the last of these was at the pub, so I had a pint of John's excellent home-brew. Indeed, I pedalled off there early so that I'd be sure of getting a drink before the meeting. When one is quite unreasonable, does admitting it make it okay? Today, I was talking to the Head about him having extra meetings every night this week, and searchingly asked when he'd take a break. At the weekend, he said, except of course for the report he has to write for the governors' meeting next week. I tutted and fussed a bit (whilst acknowledging that, of course, I realised that all the work needs to be done and that's that) ... and then asked him to do something else for me, which is-school related, but not actually quite reasonable for me to ask. And he kindly agreed, and then I mentioned that it made more work, against all I'd been saying - it isn't what you say, of course, but what you do, and I really was stretching a point there. I was interceding at the wish of a parent who is a personal friend, and for a very specific reason which, all the same, is beyond anything I'd normally do - and I wasn't asking for a decision to be changed, in fact, just for a personal intervention that will motivate a pupil, I hope. So, it's okay, but borderline, and you have to know that someone won't take it amiss to do that. I do feel rather guilty, actually - and I did apologise, but even as I said sorry (an apology, not expressing sympathy) I said that it's all very well saying sorry when you've got your own way. He laughed. Ahem. I never, in all the years when I was a governor and Ro was a pupil, intervened one bit on his behalf, you know. It's quite wrong to do that, I think. I never went into a lesson where he was a student, kept a low profile, never used any inside knowledge. I trust that no one would have thought I was wanting any extra attention, but I went the other way if anything. Still, being self-reliant is good for people. Make him fight his own battles, I say. Anyway, if I was wrong, it's too late now. Next summer, it'll be ten years since he left school. Gosh. There have been a few changes in the village. One old lady just died, days before her hundredth birthday. She was sent here as a refugee from London, back in wartime, with her two little boys. The Sage, as a small boy, rushed in to his mother. "I've got a new little baby brother or sister, who's in a pram on the lawn!" Ma had to explain that she was babysitting for Mrs M., sadly it was not the Sage's baby brother at all. Mrs M. liked it here and her husband, in due course, joined her and they lived here all their lives. And Gordon and Jill have just moved away, they retired here and have joined in lots of village events and societies, and we'll really miss them. Friends have just sold their house and haven't found another yet, it seems that they will have to move out of the village. After our meeting this evening, a few of us were scheming for them to be put in touch with the family of another old friend who has died, maybe they might like his bungalow? I was awake again for a couple of hours in the night, but we rather dismally overslept this morning. Fortunately, it didn't matter. Regarding *friends for a particular reason*, it seems to be a man thing - or is that unfair, and it's actually a Sage thing? I shall explain what I mean, but please don't take this as a complaint, I love the Sage and all his interests dearly, and I don't mind ... but once in a while, it'd be nice if he shared some of my interests as I do his. If you asked me to list mine, for example, books and music would come high on the list. Neither would feature anywhere on his. But pretty well everything that he would itemise is something that I am prepared to take an interest in, and this isn't reciprocated at all. I could do a long list, but it wouldn't really help matters- the point is not what they are but that I obligingly take an interest because he does, and it wouldn't occur to him to do the same thing. I did have a bit of a go, a year or two ago - "you hardly ever encourage me," I said. "I don't discourage you," he defended himself. Um. A silence fell. The truth is, he assumes I will engage in his enthusiasms - and I do, I don't want to leave the impression that we go our separate ways entirely - while he is just indulgent towards mine without thinking that they should involve him. We have agreed to differ for more than 38 years, there is no likelihood that things will ever change. Fortunately, we both like our own space and shy away from the notion of doing everything together. I'm not sure how this makes us look here, probably not a very attractive couple, but I know I'm not explaining it well at all. In particular, I don't want to make him sound unsupportive - it's just that he's more single-minded than I am (single isn't right either, he has a range of interests) - it's the difference between a specialist and a Jack of all trades. He masters, I dabble. He supports my enthusiasms, if he doesn't share them. Except, I will say, for the friends I've made through blogging. There, he has been absolutely delightful. He hasn't felt excluded, but has somehow understood how engaged I've become with people I had never met. It helped, of course, that my very first blog-meet included him, and that it was with the delightful charming but picky Blue Witch, with whom I felt such an instant rapport whose lovely husband is similarly warm towards this unusual sort of friendship. That he liked them so much gave him confidence that internet friendships are not odd. Necessarily. And, darling man, he was entirely warm and welcoming when we had our party to celebrate the building of the wall back in May. I suppose we suit reasonably well after all. I just remembered I didn't feed the children's goldfish. They feed them just before they themselves go to get ready for bed, about 7 pm, which isn't a time when I'm likely to be thinking about goldfish, being ready to start thinking about feeding me. I went through, gave them their pinch of dried food, switched the light from the day bulb to the night bulb (they spoil those goldfish) and picked my way back, in the dark, down their garden path and across to my porch door. It's been a quiet day. The Sage was out for most of it. To be fair, he did suggest I might go with him, but he was first planning to check out a bric-a-brac sale, which I would frankly not enjoy - we've got enough muck'n'tat around this house without adding to it or looking at other people's cast-outs, and then call on friends who, while very charming are a bit ... one topic, shall we say. It's a topic that the Sage is more interested in than I am and a couple of hours of disguising boredom and wishing I could be home reading the Sunday papers - I could see where this would lead, so I cut out the wishing and stayed at home, in the sunshine for a while, indoors in the cool for a while longer. I'd have loved to go to sleep, and drank a hopeful glass of wine at lunchtime, but it didn't make me drowsy. I'm just plain tired, not having slept enough for the last couple of weeks. I'm just drifting off at night when the Sage thwacks himself cheerily into bed and starts chatting. Delightful as this is, it wakes me up again and I can only catnap for the next few hours, having missed the chance to get into a deep sleep. Still, a few meetings to come this week. If I can't have a little doze through one or two of them it'll be a poor do. But on to another matter. I said sympathetically to a friend last week, "oh, I am sorry." "No, it's not your fault," she replied. Well no, I wasn't trying to take the blame for her car needing two new tyres and some work on the brakes, I was sorry for her rather than apologetic. But...surely she realised that? Does one have to say "I'm so sorry to hear that," or similar, for it not to be heard as an apology? Hmm. Brilliant day today, and gorgeous weather. Weeza and the children spent the day with us, while Phil cycled over to friends near Cambridge. It's about 45-50 miles each way, but he's staying overnight and, in any case, that's about what he normally cycles in a day when he commutes. Augustus is six weeks old today, so I took photos of him and his mother, she holding a photo of me and her when she was the same age. We did the same when Zerlina was six weeks, although I was in those pictures. I also took some sweet photos of Hadrian yesterday. He's become very smiley now, a real charmer. Gus also smiled at me today, for the first time that I was sure it was a real smile and not just a chance expression. All so delightful. Al and co left at lunchtime and have arrived safely at their Dorset destination. It feels very quiet here tonight. It's not as though we'd normally see or hear anything of them in the evening, but just knowing they aren't there makes it feel unnaturally quiet. Weeza is quite looking forward to stretching out all over their bed tonight, however. We agreed, the occasional night to oneself is a luxury. The Sage is much too polite to admit it, but I suspect he feels the same.